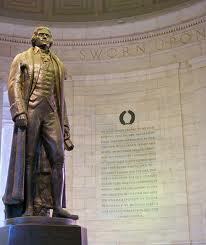 Thoughts on Thomas Jefferson Memorial “Dance Party”: It’s about the Snake! This past Saturday, 04 June 2011, my son and I happened to be in Washington D.C. The timing coincided with the second installment of what is termed: “Dance Party at TJ’s”. These public displays of dance are in protest of a Supreme Court ruling which upheld a United States Park Service regulation outlawing public-displays of this nature in certain areas of public property. The Jefferson Memorial rotunda was at the center of this decision. The first “Dance Party at TJ’s” resulted in multiple arrests and very heavy-handed tactics in carrying out those arrests by Park Service Police. This second “Dance Party at TJ’s” was a direct result of how the first was handled. I will admit, as the “dancing” began it was a bit awkward. Personally, I enjoy and believe in adhering to the intended reverence a memorial denotes. Then, in a matter of but a few moments, a soothing calm erased the feeling awkwardness. As I watched this disparate group — all ages, both sexes, many cultural and racial backgrounds, all across the political spectrum, varying social and economic backgrounds — performing, in what was admittedly a bit unseemly and raucous dance moves (nothing lewd, mind you – just what would “normally” be deemed “inappropriate”…if that is possible give that this was an “abnormal” situation), I gazed toward the face of Jefferson. At this moment in time the Jefferson Memorial was home to scores of U.S. Park Police, S.W.A.T., uniformed officers with what appeared to M-4 automatic weapons, uniformed officers in riot gear, mounted police (both horse and motorcycle) what I’ll call “plain-clothes dudes”. All there to…??? Just above the head of the Thomas Jefferson statue, inscribed around the bottom of the dome, I re-read the words of Jefferson: “I have sworn up0n the altar of god eternal hostility against every form of tyranny over the mind of man”. I looked back at the dancing crowd…gazed toward Jefferson…immediately thought of Voltaire’s influence on Jefferson and the Voltaire quote paraphrased by Jefferson: “I may not agree with what you say, but I will defend to the death your right to say it.” Another scan of the “dancing” group was all it took…the Spirit of Jefferson was all around. He was smiling from the Heavens above. This was what FREEDOM looked like! What are the “Dance Parties at TJ’s” REALLY all about? 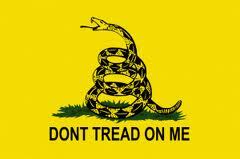 It’s about the rattle-snake as illustrated on the Gadsden Flag…”Don’t Tread On Me”. It’s about the warning system Benjamin Franklin wrote of when describing the symbolism of the rattlesnake on the flag: “She never begins an attack, nor, when once engaged, ever surrenders: She is therefore an emblem of magnanimity and true courage. … she never wounds ’till she has generously given notice, even to her enemy, and cautioned him against the danger of treading on her.” Notice was the purpose…We, the people of these United States of America know what Freedom looks like and what we are experiencing today is NOT recognizable! NOTICE!